Located in the capital city of Pretoria, Southern Sun Pretoria is a perfect blend of elegant design and traditional hospitality. The hotel is popular among politicians, diplomats, and officials, due to its proximity to the many embassies, consulates, and government offices. The hotel offers a choice of 240 well-appointed spacious en-suite rooms, with a host of amenities which include complimentary WiFi, in-room tea and coffee facilities, electronic safes, DStv and undercover parking. 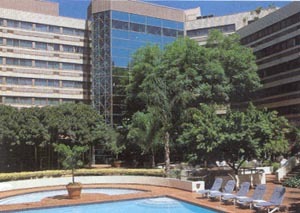 Southern Sun Pretoria offers a choice of conference and function venues suitable for different occasions. These can be configured to host a range of events from an intimate boardroom meeting for 12 to a cocktail function for 520 guests. A team of professional banqueting managers are available to assist in planning the perfect meeting, conference, convention or private function.